Back in 2003, I was a passionate vinyl DJ and an electronic engineer student. I was dreaming to own the first vinyl emulation technology ever made (FinalScratch) but it was too expensive for me. So I started to build my own vinyl technology right in my dorm room! I wanted to build something cheaper without the need of any hardware. I soon needed a name for my tech. A combination of letters would be cool. So I was looking around for inspiration when I suddenly looked at my DVS skateboard shoes. The "Digital Vinyl System" formulation instantly came up in my mind. It is amazing to see that it is now a generic term used worldwide used by millions of people! [...] J 'apporte de l'importance a nommé ce concept, j'ai pensé à DVS (digital vinyl system). [...] Je pourrai ainsi t'envoyer la librairie et un vinyle. 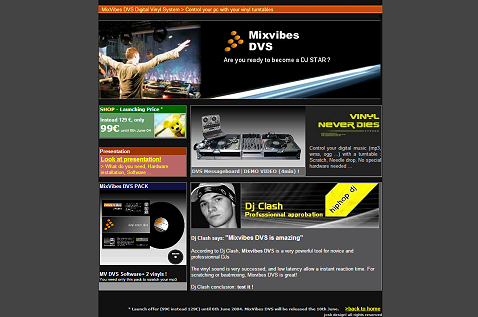 English translation : I want to give a name to the technology, I thought about DVS (digital vinyl system). [...] I will be able to send you a vinyl and the analysis module. 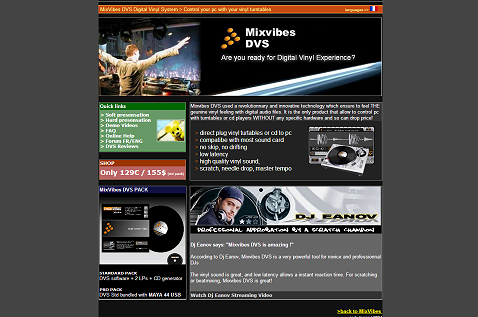 The famous DJ software company MixVibes integrated the DVS technology into their products in 2004.